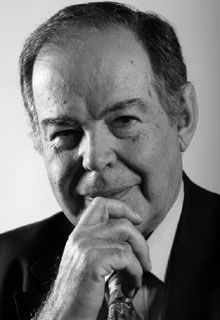 Edward de Bono was born in Malta in 1933. He attended St Edward's College, Malta, during World War II and then the University of Malta where he qualified in medicine. He proceeded, as a Rhodes Scholar, to Christ Church, Oxford, where he gained an honours degree in psychology and physiology and then a D.Phil in medicine. He also holds a Ph.D from Cambridge and an MD from the University of Malta. He has held appointments at the universities of Oxford, London, Cambridge and Harvard. Dr Edward de Bono is one of the very few people in history who can be said to have had a major impact on the way we think. In many ways he could be said to be the best known thinker internationally. He has written numerous books on thinking with translations into 34 languages. In 1988 he was awarded the first Capire prize in Madrid for a significant contribution to humankind. Dr de Bono has worked with many of the major corporations in the world such as IBM, Du Pont, Prudential, AT&T, British Airways, NTT(Japan), Ericsson & Total. The largest corporation in Europe, Siemens (370,000 employees) is teaching his work across the whole corporation, following Dr de Bono's talk to the senior management team. When Microsoft held their first ever marketing meeting, they invited Edward de Bono to give the keynote address in Seattle to their five hundred top managers. Edward de Bono's special contribution has been to take the mystical subject of creativity and to put the subject on a formal basis. He has shown that creativity was a necessary behaviour in a self-organising information system. His key book, 'The Mechanism of Mind' published in 1969 showed how the nerve networks in the brain formed asymmetric patterns as the basis of perception. The leading physicist in the world, Professor Murray Gell Mann, said of this book that it was ten years ahead of mathematicians dealing with chaos theory, non-linear and self-organising systems. The term 'lateral thinking' was introduced by Edward de Bono and is now so much part of everyday language used to describe different thinking. There is a huge need world-wide for thinking that is creative and constructive that can design the way forward. Many of the major problems in the world cannot be solved by analysing and removing the cause - there is a need to design a way forward even if the cause remains in place. In 1972 Edward de Bono established the Cognitive Research Trust as a charitable organisation devoted to the teaching of thinking in schools (see CoRT Thinking Tools). The de Bono methods provided the tools and techniques for this new thinking. Perhaps what is so unique about Edward de Bono is that his work spans the generations - from teaching 7 years-olds in primary schools to working with senior executives in the world's largest corporations. His work also spans many of the world’s cultures and continents making his work truly global. Established in 1984, The Edward de Bono Foundation was formed to provide an approved and lasting legacy of Edward de Bono's work on Creativity & Constructive Thinking. The Foundation is concerned with the teaching of constructive and creative thinking as a skill in Education and Business around the world. In December 1996, The Edward de Bono Foundation in Dublin hosted a European Union sponsored conference on "the teaching of thinking in schools" and through a number of initiatives has firmly placed thinking skills as an essential part of the educational curriculum in many countries. As a non-profit charity The Foundation provides support to organisations around the world helping change peoples’ lives through better thinking. One of its latest projects is to provide a mobile classroom to give even the most remote or disadvantaged people access to thinking lessons to help them achieve a better life.